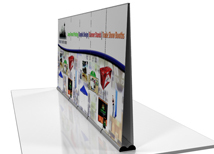 Banner stand walls are an affordable back wall graphic display option. You can use multiple banners to create a full back wall or use one at a time for smaller shows. All of our banners are printed on a curl resistant vinyl to keep your banner back wall smooth show after show. Individual graphics can be replaced making re-branding an affordable option for multiple shows. You can use our graphic design team to create a graphic that is practical and effective and will allow you to change single banner stands with out reprinting the entire backdrop. Size - 96.5" x 83.25"
Size - 112.5" x 83.25"
Size - 230" x 83.25"
All of our banner stand walls are printed on high quality graphic material giving you a smooth backdrop that will not curl like cheaper materials. These back walls are a great alternative to other back wall systems because they have a low up front cost and graphic replacements are quick and inexpensive. 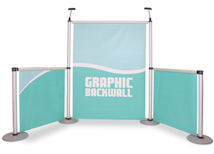 Every basic banner stand wall has an optional shipping case that will fit the entire banner wall for easy transport. Basic banner stands are a great compromise between quality and affordability. 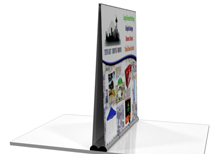 They are built to last a lifetime but do not have all the features of our premium banner stands. Basic banner stand hardware holds a one year Warranty against manufacturing defects and are built to last for years of exhibiting. The Orient and Uno lines are very popular throughout the United States because of their great value and their flexibility to be converted into graphic back walls. NWCI has very low markups giving you more product for less money. We also offer quantity discounts on all of our banner stand walls making it wise to purchase multiple banner walls at one time. We have all the graphic templates on our site in multiple formats, so you can create your own design quickly and easily. We also offer design services for companies who need help marketing their products. 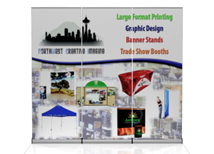 Banner stand walls can also be used as single banner stands for smaller shows or recruiting events.